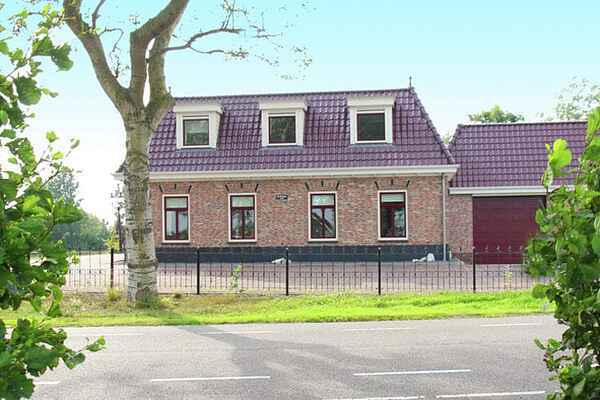 This new, comfortable holiday home is located by the North Holland Canal, at the edge of the quaint village of Akersloot. A lovely place for water sport enthusiasts and bikers: the canal is directly connected to the Alkmaarder lake, the place to go sailing, fishing and swimming (boats and surf boards for rent). For bikers the beautiful ferry route is an absolute \"must!\". If you're ready to experience a little culture you head to the historical cheese town of Alkmaar. You can board a boat leaving for the cheese market in front of your holiday home. The beaches of Castricum and Egmond aan Zee are within easy reach. There is a large living room on the ground floor with a comfortable kitchen as the central focal point. One of the bedrooms is located on the ground floor. It has a luxurious bathroom with bathtub, shower and toilet. The other four bedrooms are on the first floor. They all have their own wash basin. On the first floor you will also find a bathroom with shower as well as a separate toilet. The children can play there undisturbed. Although the grounds are fenced in, we don't think that the home is suitable for young children, due to the proximity to the water and the road. Approximately fifty meters from your holiday home there are two lovely donkeys, a goat and a Shetland pony. A nice surprise for the children! You can also rent canoes and electric bicycles.